PPE stands for personal protective equipment. A PPE vending machine is starting to be a very important topic in the world of workplace health and safety. A lot of construction sites and other workplaces focused on injury prevention and worker health and safety are investing in having PPE vending machines on site. With new bills in place by governments and area workplace health and safety boards, it is ever more important for companies and employers to take extra steps to ensure that workers are kept safe, and that they have immediate self directed access to protective wear in place. It is then the responsibility of the worker, to ensure that should they forget, misplace, or break their personal protective gear, that they take action to immediately replace their gear while at the workplace. PPE vending machines form IVM typically stock overalls, mechanical gloves, hi visibility vests, safety goggles, ear plugs, dust masks, riggers gloves, headlamps, batteries, torches, and many other important safety gear relevant to the specific workplace it is designed for. Some PPE machines also can dispense cutting and fan wheels, flap discs, brushes, adhesives, electrical tape, manuals, and much more. Why are PPE Machines Now Preferred Over Stock Rooms? PPE machines are useful for tracking data. Inventory levels, consumption of certain products, individual usage, and other monitoring reports to understand the inventory replacement needs are available through each machine. 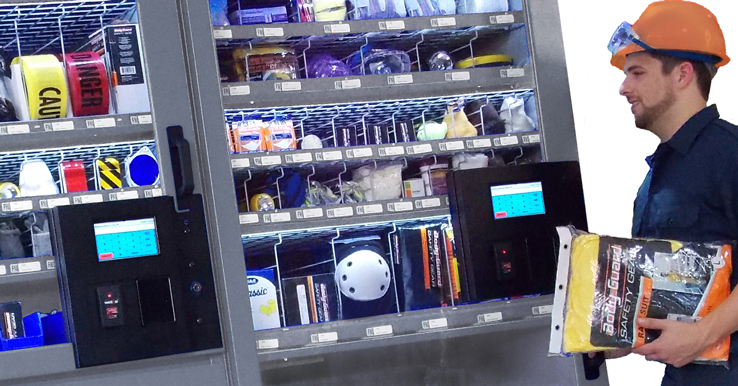 PPE vending machine usage means that overstocking items is no longer necessary. It also means that because it is in a high visibility accessible area of the workplace typically a hallway, that workers are more likely to replace their equipment as needed. Finally, stock rooms can get overcrowded or poorly maintained. Neatly placed PPE machines display protective gear nicely and new material is always being replaced instead of having lots of leftover unused equipment getting dusty in the back of a stock room. PPE machines are also important because they help employers to save money via not needing staff to constantly monitor inventory. The PPE vending machines are smart machines. They automatically email the manager when stock becomes low. The great thing about these machines is that they are versatile. They are able to handle different types of inventory, they are built sturdy so that they can handle a variety of landscapes and areas including heavy industrial areas, factory facilities, engineering facilities, mining areas, and manufacturing areas. Overall the PPE vending machine industry is booming. Employers are realizing how important they are for workplace health and safety. They are also good for cost effective worker protection systems. With these machines on the market, employer roles are made easier, and workplaces are made safer. Inventory is kept clean and updated, and equipment is more readily accessible. It is likely that more and more workplaces in 2016 will be implementing this machinery into their daily operations. For more info please check out the vending solutions.